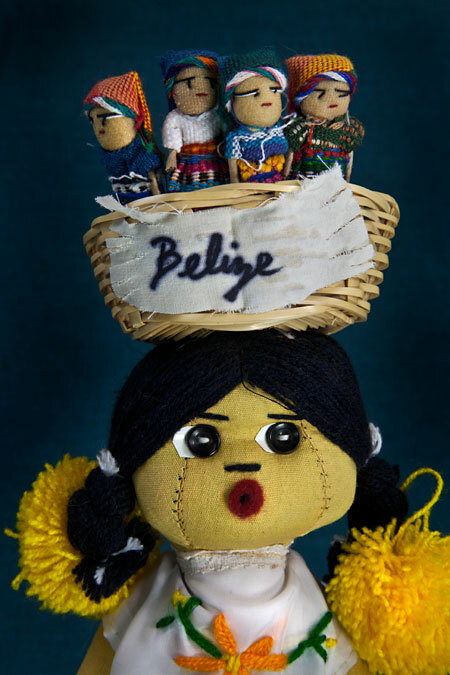 Female Doll from Belize with “worry dolls” on her hat. 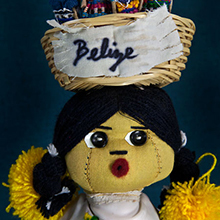 Belize girl made with stuffed cloth. 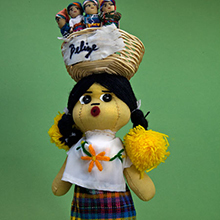 She has button eyes and yarn hair with pompoms on the end of her braids. She is wearing a woven skirt with lace trim. Her blouse is white cotton, and it has a flower made from yarn. 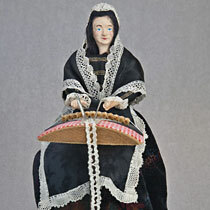 She has a straw basket on head with four worry dolls (small colorful figures) in the basket. She has leather sandals on her feet. 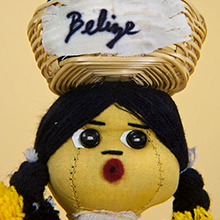 She was designed to represent the culture of Belize. 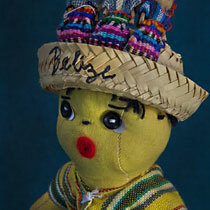 My name is Tomitch and I live in a small village in the Central American country of Belize. My village is located several miles from the capitol city of Belmopan, and we are direct descendants of Mayan Indians. 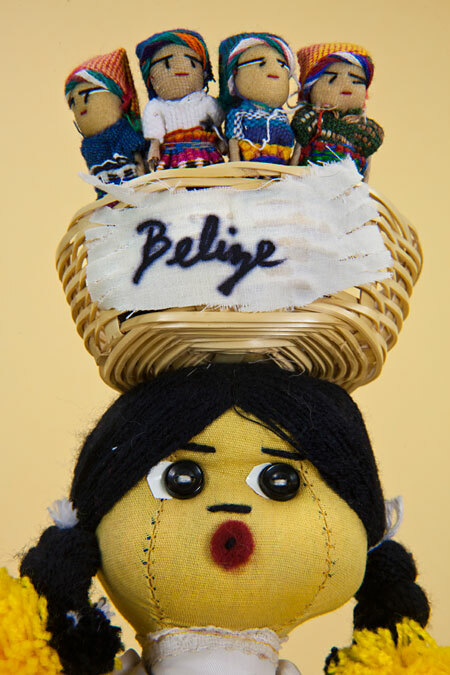 Belize became an independent nation in 1961—before that England ruled over us. 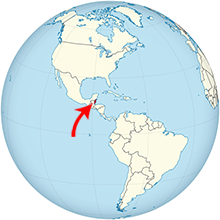 The actual translation of the name Belize means muddy waters. I speak both English and Spanish, and I am ten years old. I live with my grandfather in a small house at the edge of a large forest. Belize has very tropical weather. Sometimes we get fierce hurricanes with strong winds and heavy rains. My grandfather loves to tell tales that he heard when he was a young boy. One stormy night, my friend Zooie and I were sitting on the floor ready to hear one of grandfather’s stories. Since Grandpa knows I love to hike through the forest with my friend, he warned us that we should be wary of the sisimite (also called sisemite or sisimito) creatures, who live in deep underground caves. We both sat petrified as Grandpa told us the story. The only light in the room came from a small candle that cast an eerie shadow of my grandfather’s image on the wall. He began describing the sisimite creatures as being very short with very hairy bodies. It makes them look more like apes than people. When he described the features of this ape-like animal, we could hardly believe what he said. He talked about their feet, and said that their heels were actually on the front of their feet and the toes were on the back. Because of this, their footprints make it appear as if they are heading in the opposite direction. So when their enemies see this, it seems as if the sisimites are traveling away, only to discover the monsters are really very close by. Grandpa told us that this ape-like animal has one weakness. It is afraid of water and dogs. It was now quite late. We both looked at one another almost afraid to move. My grandfather saw the fear on our faces so he turned on the lights in the room. He smiled and assured us that his story was only a fable and that we need not worry about meeting such creatures walking through the forest. However, he did say that if we should make sure that we take our dogs with us and never stray too far from the river.